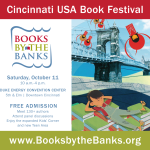 Next Saturday (October 11th) I’ll be selling and signing copies of my novella Roller Girls Love Bobby Knight (Winner of the 2013 Deerbird Novella Prize) at CIncinnati’s largest literary event Books by the Banks. The event will be held at The Duke Energy center with doors open to the public at 10 AM. A complete list of authors and events can be found here. I hope to see you all there!